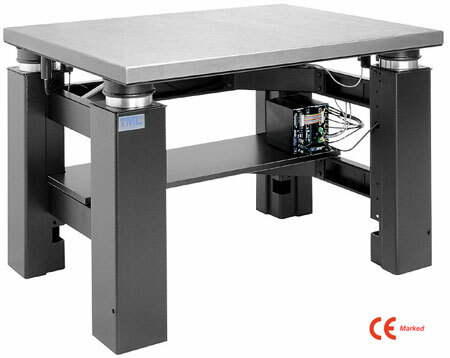 TMC’s Active Vibration Isolation Table features state-of-the-art vibration isolation performance. By integrating our new Compact Sub-Hertz Pendulum Isolation System (CSP®) for horizontal vibration reduction with our new PEPS-VX® Inertial Damper for vertical vibration cancellation, we have produced a superior, ultra-quiet table in six degrees-of-freedom.Vibration Isolation Performance This advanced isolation technology may be combined with TMC optical tables and other TMC products, as well as designed into equipment for OEM applications. Featuring 10 dB of isolation vertically and 20 dB of isolation horizontally at 2 Hz (a frequency at which other tables amplify vibration), the Active Vibration Isolation Table is ideal for the most demanding applications in unusually severe vibration environments. Compact Sub-Hertz Pendulum Isolation System (CSP®) for 0.5 Hz horizontal resonant frequency. 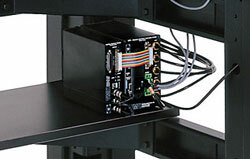 PEPS®Precision Electronic Positioning System for non-contacting height control of isolated surface to one micron. PEPS-VX® Vibration Cancellation add-on to PEPS® Precision Electronic Positioning System for low frequency vibration cancellation in the three vertical degrees-of-freedom. Rigid steel frame construction in a desk-style configuration. Medium texture black powder coat frame; stainless steel top.